You can now experience the JAL SKY SUITE 767 seats at SKY MUSEUM. Image by Japan Airlines. 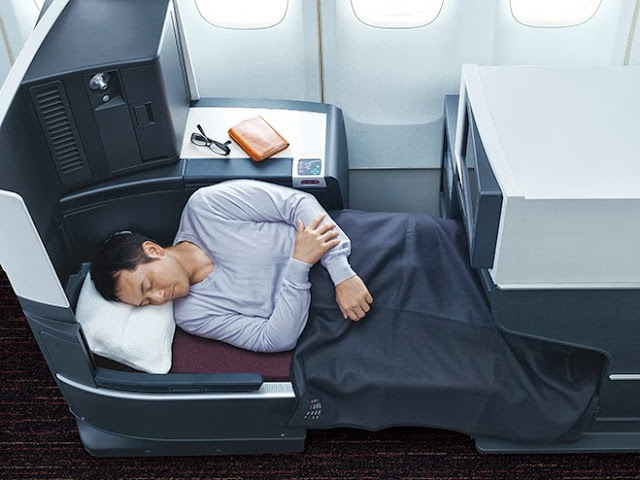 When Japan Airlines (JAL) first released the details of the new long-haul and medium-haul Boeing 767-300ER cabins, JAL SKY SUITE 767 (SS6), it states that designs of the Business Class seat dubbed JAL SKY SUITE II might be slightly different from the rendering pictures. But looks like JAL has finally completed the design of JAL SKY SUITE II as it has updated the Japanese version of the SS6 website with new images of the real seats and set up demo units at the JAL SKY MUSEUM. JAL is also running a social marketing campaign to promote the new SS6 cabin which will be first rolled out to the Tokyo Narita - Vancouver route in December 2013, followed by the Tokyo Narita - Kuala Lumpur route in January 2014, and will eventually be expanded to other long-haul and medium-haul routes such as Honolulu by the end of fiscal year 2014. Demo units of the new JAL SKY SUITE II seat at SKY MUSEUM. Image by Japan Airlines. If you want to try out the new seats before its official launch, you will need to first sign up for JAL's hangar tour as the SKY MUSEUM is part of the tour now. Another option is to visit JAL booth at the JATA "TABIHAKU" Travel Showcase 2013 on September 14 and 15. In the past, JAL has collaborated with some local restaurants to create the JAL Welcome! New Sky Cafe in which JAL put the demo units of the seats in the restaurants and the restaurants would serve dishes from the new JAL BEDD menu. No words on the JAL Welcome! New Sky Cafe so far but usually JAL doesn't announce the details until a week or two before so I wouldn't be surprised if JAL would do this again this time. But for now, the SKY MUSEUM (if you could find availability) and the travel showcase are your only options. Can't find availability to visit the SKY MUSEUM or you are not in Japan? Well, your next best choice to find out more about the new seats is the new Social Catalog site (Japanese only) JAL has just launched. At the Social Catalog, you will be able to read comments with pictures form the lucky ones who had tried out the new seats already. And JAL calls this the "Comfortable! 15 Secrets of the New Seats". Right now, there's no mobile version of the site yet but JAL plans to release the mobile version in mid-September. 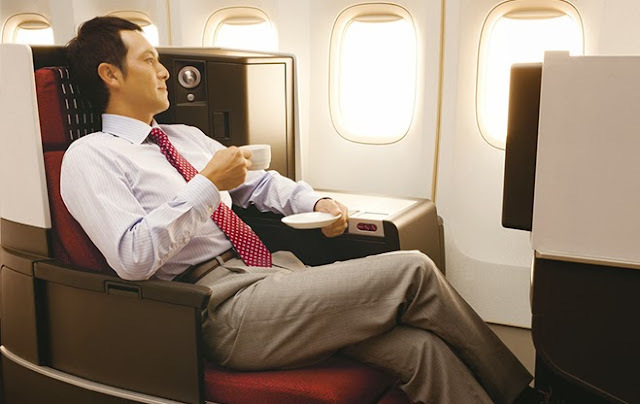 Also, JAL will expand the Social Catalog to cover the SKY SUITE 777 (SS7) seats in October. So what's so "social" about the new site? You can like the comments and post on your Facebook wall through a click on a single button on the site. The ranking of the comments will change according to the number of Likes each received. And JAL is running a marketing campaign for the Social Catalog as well. During September 2 and December 2 2013, as long as you like one of the comments, you will be eligible to win one of the prizes. The campaign is divided into 3 phases with different prizes. So you have 3 chances to enter. Winners will be determined by a random draw. The first phase has already started and will end on September 30. Prizes for this phase include a round-trip ticket from Tokyo to Vancouver (1 person) and JAL Original Tohoku cotton pocket handkerchief (30 persons). Phase 2 will be October 1 - October 30 and Phase 3 will be November 1 - December 2. Prizes will be announced at a later day. OK so what if you don't read Japanese? You can still look at the pictures, and there are more on the SS6 Japanese site and JAL will probably update the English version soon. But for now below are the new marketing pictures released. 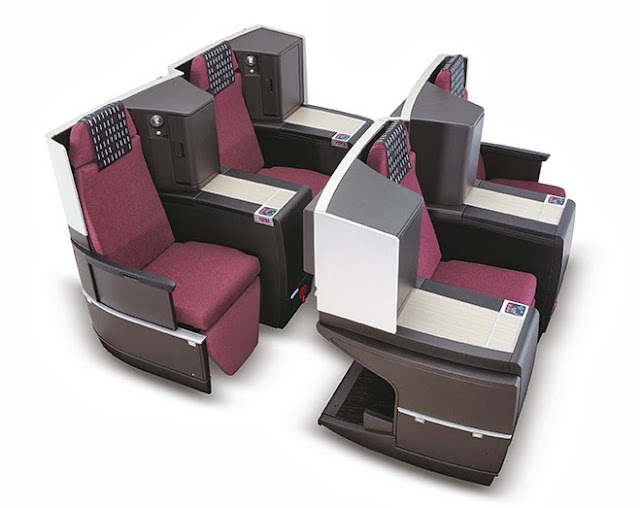 The new JAL SKY SUITE II seat. Image by Japan Airlines. The JAL SKY SUITE 767 Business Class cabin is arranged in a 1-2-1 layout. Image by Japan Airlines. 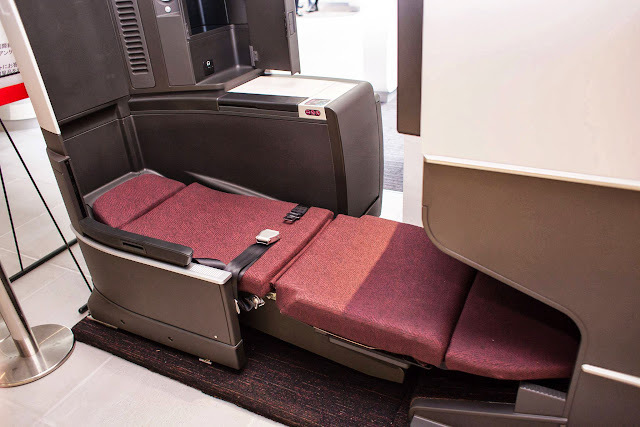 The JAL SKY SUITE II seat can turn into a fully flat bed. Image by Japan Airlines. JAL SKY SUITE II comes with 15.4 inch touch screen monitor. Image by Japan Airlines. JAL SKY SUITE II has a large side console and dining table. Image by Japan Airlines. Adjustable reading light with 4 levels of brightness and dedicated storage area conveniently located right next to the seat. Image by Japan Airlines. JAL cabin attendant calendar is back!